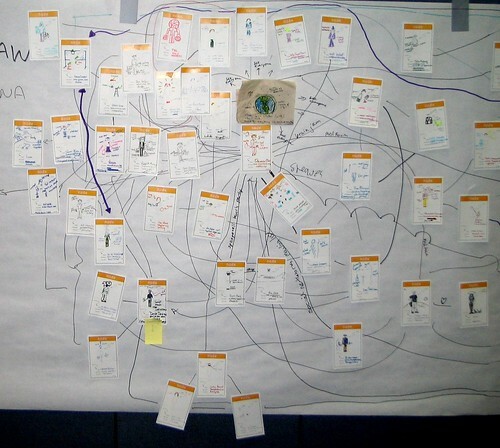 The object of this game is to introduce event participants to each other by co-creating a mural-sized, visual network of their connections. 25 minutes to create the first version of the network; the network remains up for the duration of the event, and may be added to, changed, or studied throughout. To set up the game, all participants will need a 5×8 index card and access to markers or something similar to draw their avatar. They will also need a substantial wall covered in butcher paper to create the actual network. 2. Create the avatars. After a short period of time (and probably some laughter and apologies for drawing ability), the participants should have their avatars and names created. At this point, the emcee may add a variation, which is to ask the group to also write two words on the card that “tag” who they are or what they’re interested in at the event. 3. Make the connections. Next, the emcee directs participants to stand up and bring their cards and a marker to the butcher paper wall, then “upload” themselves by sticking their card to the wall. 4. 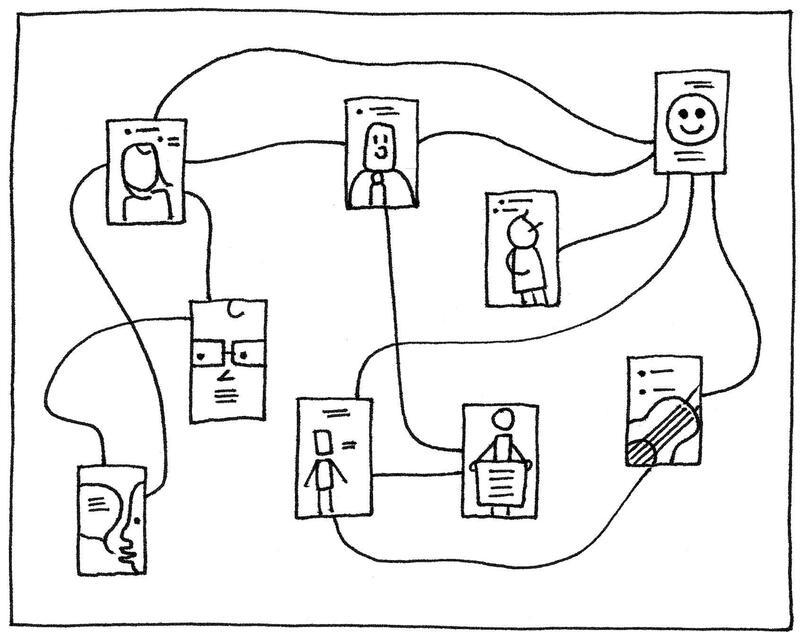 The next task is simple: find the people you know and draw lines to make the connections. Label the lines if you can: “friends with” or “went to school with” or “went mountain climbing with.” This continues for a time and is likely to result in previously undiscovered links and new friends. The initial network creation will be somewhat chaotic and messy, resulting in a mural that has a lot of spaghetti lines. Over the course of the event, participants may browse the network. Encourage this, and see what new connections are made. 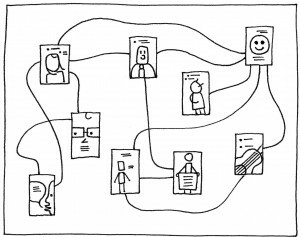 The source of Low-Tech Social Network is unknown.